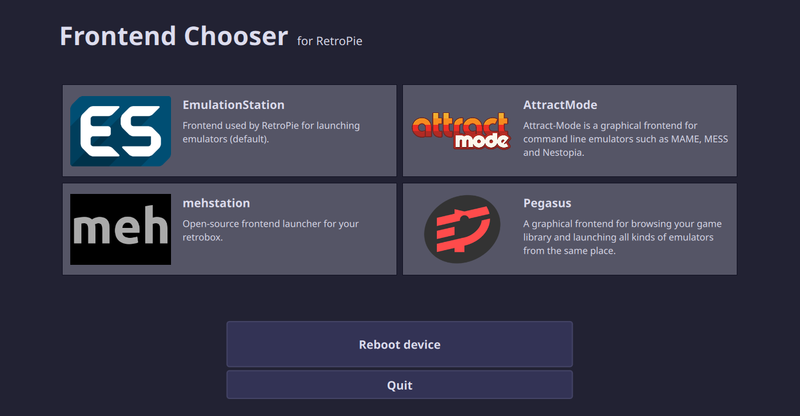 Note: you will need RetroPie version 4.3 (released on September 21, 2017) or later to install Pegasus through RetroPie. You can start the RetroPie setup script from the terminal (sudo ~/RetroPie-Setup/retropie_setup.sh) or from another already installed frontend. You will be greeted with a text-based interface. To install Pegasus, select Manage Packages → Manage experimental packages → pegasus-fe → Install from binary. The latest release will then be downloaded. You can also update your existing installation here. After the installation, you can either call /opt/retropie/supplementary/pegasus-fe/pegasus-fe manually, or edit /opt/retropie/configs/all/autostart.sh to launch Pegasus on boot (instead of eg. ES2). There's also a graphical tool for installing various frontend and setting them up to boot automatically.